SAN PEDRO, California, September 6, 2012 (ENS) – Two electric battery-powered heavy-duty trucks that will help cut pollution at busy Los Angeles County ports were unveiled today at PortTechEXPO 2012, a symposium for green transportation technologies. The ports are a major source of diesel emissions in Southern California, which has some of the worst air quality in the country. Current port trucks consume large amounts of diesel fuel and emit toxic pollutants and greenhouse gases. These large Class 8 trucks are port drayage trucks that haul cargo containers to and from seaports. They transport containers relatively short distances, usually between ports and regional warehouses or intermodal facilities, where containers are transferred between trucks and freight trains. One of the heavy-duty industrial trucks – a Navistar International Pro-Star on-road tractor designed to haul loads up to 80,000 pounds – was originally manufactured with a diesel engine. The truck was retrofitted with all battery-electric drive-trains powered by lithium ion batteries to run as a zero emission vehicle. Energy Commission funding was key to the development of several advanced components needed for the truck. The advanced components and drive-train package for the trucks were developed by TransPower. Based in Poway, California, the company received $1 million in research funding from the Energy Commission’s Alternative and Renewable Fuel and Vehicle Technology (ARFVT) program and $500,000 from the South Coast Air Quality Management District. TransPower says the need for its “ElecTrucks” is most evident at America’s largest seaport, California’s San Pedro Bay Port complex, which includes the Port of Los Angeles and Port of Long Beach. The area surrounding this port complex has been nicknamed the “Diesel Death Zone” by environmentalists, who are alarmed at the elevated cancer rates and incidences of lung disease among area residents. Much of the pollution in this region is created by the 10,000 drayage trucks that visit the San Pedro Bay Ports in a typical year. The other heavy-duty industrial truck displayed at PortTechEXPO is a Kalmar Ottawa off-road tractor that was funded by the Texas Commission on Environmental Quality. The technology used in this truck was developed as a result of the success of the Navistar vehicle. To reduce air pollution, the Port of Los Angeles has implemented a Clean Truck Program, which provides incentives for truck owners and operators to replace older, polluting trucks with newer, cleaner truck models. 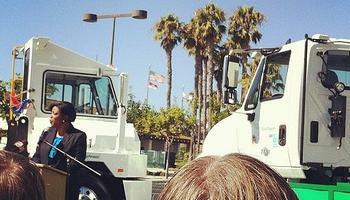 The Port of Los Angeles is also actively supporting the development of new electric truck technologies. Since 2005, the ports of Los Angeles and Long Beach report reducing port-related emissions by up to 75 percent for diesel particulates, and by 23 percent for greenhouse gas emissions. Responding to the need to reduce emissions, TransPower is leading a Port Electric Truck Initiative, PETI, with the goal of demonstrating the first practical electric port truck technology in actual drayage service by early 2013. PETI team members include Quantum, which will supply electric drive components such as motors and inverters, and Navistar, one of the world’s largest truck and truck engine manufacturers, whose products include the the International® ProStar®, the industry’s most fuel-efficient Class 8 truck. The team’s first generation of electric port drayage trucks will be operated at the Ports of Los Angeles and Long Beach by drayage firm Total Transportation Services, Inc. Following an initial demonstration in 2013, TransPower intends to quickly make affordable ElecTruck drive systems available for port drayage applications worldwide. Also on display at the PortTechEXPO is a plug-and-play electric unmanned ground vehicle used for security applications, and a bypass oil filtration system that increases engine performance. The third annual PortTechEXPO, which sold out in each of its first two years, is designed to bring together technology innovators, entrepreneurs and investors to stimulate job creation and boost the green economy of Los Angeles. The event is organized by PortTechLA, a technology commercialization center and incubator whose stakeholders include the City of Los Angeles, the Port of Los Angeles and the San Pedro and Wilmington Chambers of Commerce.